Written by Angilee Shah on August 29th, 2008 March 24th, 2017 . I went to China. It was a fantastic and eye opening trip. I took some photos and wrote a bit — will share that soon. For now — I can’t help but echo the crowd about the Democratic National Convention. I had missed the Hillary Clinton who spoke on Tuesday, the woman who was a leader not because she’s a woman and certainly not in spite of being a woman. And Al Gore gave my second favorite speech I’ve heard him give — the first is on Ted.com. But I’m no political junkie, so I’ll comment more on what I know — online journalism. I love good reporting, I love investigative journalism and I love moving images and well-placed quotes. But the meaning of news is changing and readers and consumers now demand many more options, including first-hand sources and searchability. Good journalism more and more often is a question of good design. 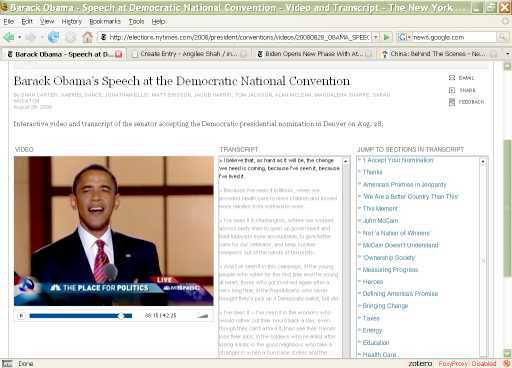 My pick for best news coverage of the DNC (if there ever was such an award) goes to the designers of nytimes.com. If you haven’t yet, watch Obama’s speech on their website. It loads fast, the picture quality is fantastic, the transcript scrolls with the speech and you can jump to different sections easily. And they did the same for Al Gore. It’s powerful. It cuts away the talking heads who recap and editorialize and speculate. It makes me more confident that 24-hour online news, with multimedia embedded, is infinitely superior to cable news alone.